My first thought when I saw this Leinster lineup was : 'Isn't it amazing how much it resembles the Irish 23 from the Grand Slam match in Twickenham?' 14 names altogether, 10 wearing the exact same number. But I should probably clarify...noticing that similarity in no way means I'm making any assumptions that the result is going to follow suit. In fact, if anything the Six Nations success is something that has to be drummed out of those players to pick them back up for this massive encounter on Saturday. For me, the match that should be used to motivate Leinster for this one is that which took place in the RDS last May. The bookies predicted we'd win by 11pts for that Pro12 semifinal, I was a bit more cautious in my preview saying 6-8, and I dare say the vast majority of my fellow fans assumed we'd finish on top by some kind of margin. And I have to say the Welsh press have done a decent job during the week presenting Wayne Pivac's men as scrappy underdogs [not to mention continuing the ridiculous 'should this be in the Aviva' whinge-fest]. Well anyone who saw what happened that evening which brought our season to an abrupt end will be having none of those mind games. The Scarlets are the reigning league champions, they fought back extremely well after a bad start to their Euro pool, and they put away quality French opposition in the quarterfinals. Then you have THEIR matchday squad, which isn't a long way off the Welsh one that ran Ireland close in February. But despite the deep supply of quality individuals, it's how they play together that we need to look out for on Saturday. When you remove the fact that they broke Irish hearts twice to win the league, anyone who appreciates rugby has to marvel at the way they managed it. Power and determination in the forwards matched by quick thinking and precision execution along the backline to provide the finish time after time. We can be in no doubt that they will be primed and ready for a repeat performance this weekend. So all of this means it's up to us to be ready as well, and I hope you don't mind but I'm not going to allow what we witnessed against Benetton last weekend to serve as any kind of indicator of what we're to expect. It's not just because it was mostly a different pool of players that evening - it's more about the fact that on our seven European outings so far this season we have been up for the battle, so we shouldn't expect any less from Leo, Stuart & co in their preparations this time. Losing Luke McGrath is definitely a blow, of that there can be no doubt. But I'm counting on Jamison Gibson-Park to step up for this one, though to do that he may have to ignore a host of his base playing instincts and go for a much simpler approach...distribute the ball quickly and let the quality outside him do the work. Speaking of which, how great is it to have Robbie back? Isa did very well in his stead against Sarries, but the 'Henrose' centre pairing is the desired one for Leinster and probably Ireland too. Assuming he's at 100% the two should do a lot to thwart the advances of their opposite numbers. Where the battle royale will be, naturally, is the breakdown. Yes, they have Tadhg Beirne at 4 who's an outstanding athlete all over the park, but we've got James Ryan. Yes, they're got James Davies who can be immovable when given half a chance over the ball, but we've got Dan Leavy. And yes, they've got Aaron Shingler who inspires all around him, but we've got Scott Fardy. 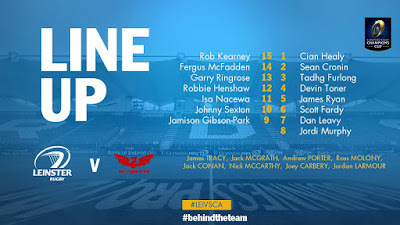 And Johnny as captain with Isa also on the park? A sign of things to come next season perhaps? I'm sure their logic is sound but while I'm backing the boys in blue to make the most of home advantage, I have way too much respect for the rugby gods to suggest such a wide margin. Just a few points is all I can muster, especially with Monseiur Poite holding the whistle in that there's bound to be a decision or two we'll be debating ad nauseum come full time. 16. Ryan Elias, 17. Dylan Evans, 18. Werner Kruger, 19. Lewis Rawlins, 20. Steven Cummins, 21. Aled Davies, 22. Steff Hughes, 23. Will Boy.